So you’ve made your New Year’s resolutions, and you’ve done it the right way, as in, you’ve followed along with our 4 Keys to Meeting Your New Year’s Resolutions: Check, check, check and check. One of your goals might be to incorporate exercise into your health routine. But where to start? 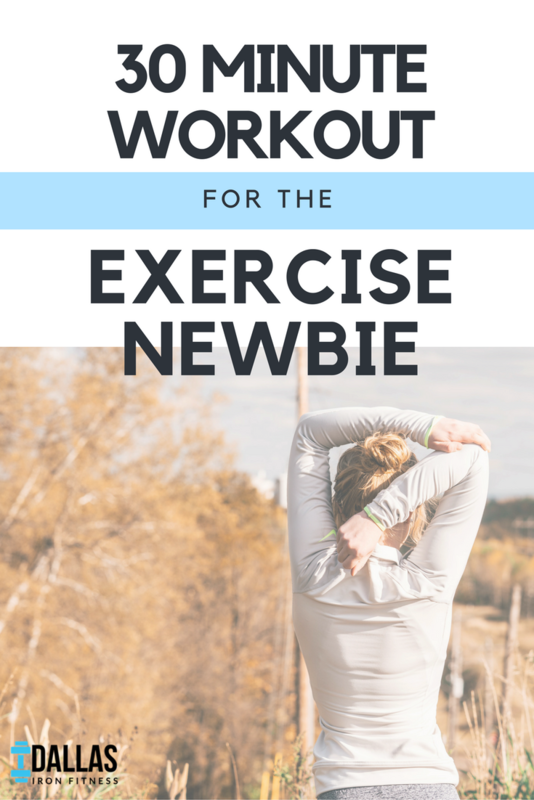 Dallas Iron Fitness is here to help—we’ve created this easy 30 minute workout just for all you exercise newbies. This can be done at a gym or at home—although you will need a step, like a curb or stairs in your home, to complete one part of the workout. The post-workout rush of endorphins will leave you feeling great after this easy 30 minute workout, and you’ll be a step closer (100% pun intended) to reaching your New Year’s health goals! Grab your Spotify playlist or favorite podcast, and begin your workout with a 10 minute walk around the block or on the treadmill at the gym. You don’t have to go hard at exercise to begin seeing health benefits; movement, no matter what, is good for you! Find a step in your home or on the curb or, if at the gym, use the step aerobics equipment for this. (Important: make sure your step does not cause your knee to go higher than a 90 degree angle when you place your foot on the step.) Step ups are as the name implies: place your right foot on the step, then step up and tap with your left foot. Keep your shoulders back as you do this. Do 10 step ups with your right foot, then alternate and do 10 step ups with your left foot. Let’s put those glutes to work! Squats mimic the motion of sitting in a chair (minus the chair, of course). Place your feet a little further than shoulder-length apart. Squat down, trying to get your hips to knee height. Be sure to keep your back nice and flat during this (you don’t want to hunch over). If you can get your squat lower—great!—but if not, just aim for knee height. The more you do this, the better and stronger you’ll get, so don’t be hard on yourself if these are difficult for you. Do 15 of these. Up next: the classic push up. If you need to modify this to placing your knees on the ground for support (rather than doing it the full extended push up), that’s okay too! It’s all about meeting your body where it is, and slowly building your strength level. Do 10 of these push ups. Now repeat these reps 2 more times for a total of 3 rounds. Before moving to the final circuit, take a swig of water and rest a minute! You’re doing great! The modified jumping jack is a low impact exercise because it doesn’t require you to actually jump so there’s no strain on your knees, but it still gets your heartrate up! Begin with legs together, slightly bent. Instead of jumping out as you raise your arms, step out your right foot while raising your arms (as you would during a classic jumping jack). Be sure to keep your arms tight to really work those muscles. Return your right foot to center position, and then step out with your left foot, raising your arms again. Remember to keep your legs slightly bent during this. Do 20 of these. Let’s do some core work. Get into high plank position—arms extended directly below your shoulder and weight on your hands in the front, then legs together and extended behind you with weight on your toes. Remain in plank position for 15 seconds. Feeling the burn yet? Crunch time! Lay on your back with your knees bent and your feet flat on the floor (the same as a sit-up position). Knees can be hip distance or together, up to you. Put your hands behind your head, lacing fingers together. Tighten your abs and crunch up—the movement is a small one. Unlike a full sit-up, you will only be lifting your shoulders from the ground. Do 10 crunches. Repeat this round of reps 2 more times for a total of 3 rounds. You did it! How’s it feel?! Time to treat yourself: a healthy fruit smoothie and catching up on This Is Us, anyone? Reach your New Year’s health goals this year with our help! With in-person and online fitness training programs (yep, you can get a workout just like this one sent directly to you! ), Dallas Iron Fitness has the right program for your goals and your lifestyle.